Yahaya Bello lies more than the tongue. What a calamity that has befall Kogi State. 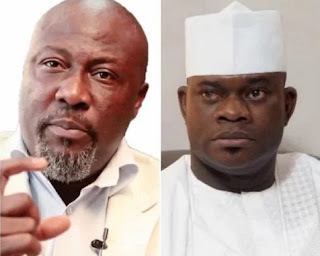 The CONTINUED SILENCE of our party, All Progressives Congress (APC) and the PRESIDENCY on the satanic manifestation of the governor will have a concomitant negative effect on the fortunes and electoral capital of APC in Kogi State, which we earlier achieved without the governor. GYB, as he is called, is grossly incompetent and too myopic to be a local government chairman let alone of being a governor of state. Once, we were blind and now we can see. It is easy to get a man a job, but you can’t do the job for him. Above all, we shall overcome. The plan to militarize the state with imported guns and thugs will fail. We will defend our people and the state with all available legal means. We shall be bolder and more vociferous in 2018. Enough is Enough. If I die in this STRUGGLE, so be it, but in an unjust society silence is a crime. I implore all CIVIL SERVANTS in the state to disregard the headmaster-like threat of the governor to them yesterday, Wednesday. We are in a democracy and a civil society. I’m willing to foot the legal bill of ANY VICTIMIZED or OPPRESSED civil servant. The conclusion of fake or forged certificates against civil servants by Bello confirms that his government is CONFUSED and not sure of what they are doing.